Yesterday was the first day of Fall. Anybody else as excited as I am about the lower temps and cool breezes? It is quite a welcoming change here in Texas that is for sure. With Fall upon us I decided to get cracking on bringing Fall into our home and the first place I started was our living room. Our living room recently got a makeover so that called for a different route on the Fall decor this year. Simplicity called out to me unlike years past. You can click here and here to see some of my previous fall mantles. We just love our little hooty owl. The Hubster thought that I had lost my mind when he saw me adding book pages to the t.v. armoire. I had to tell him not to worry. They are not permanent. Certainly a change from previous years but I am really liking it. Next up will be the dining room. How pretty!!! 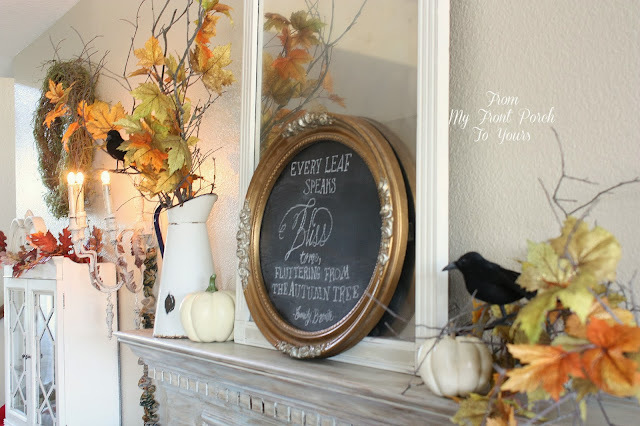 Luv all the Fall touches, especially the mantel. Thanks for allowing me to wander through... looking forward to more. I'd love to win one of the Cinnamon Berry Compote candles. 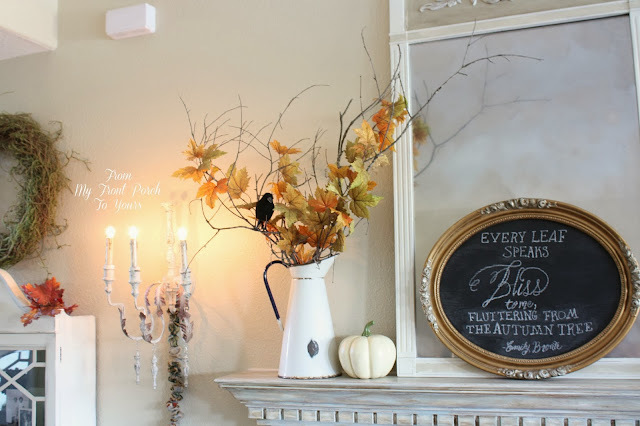 Thanks for the fall decorating inspiration! 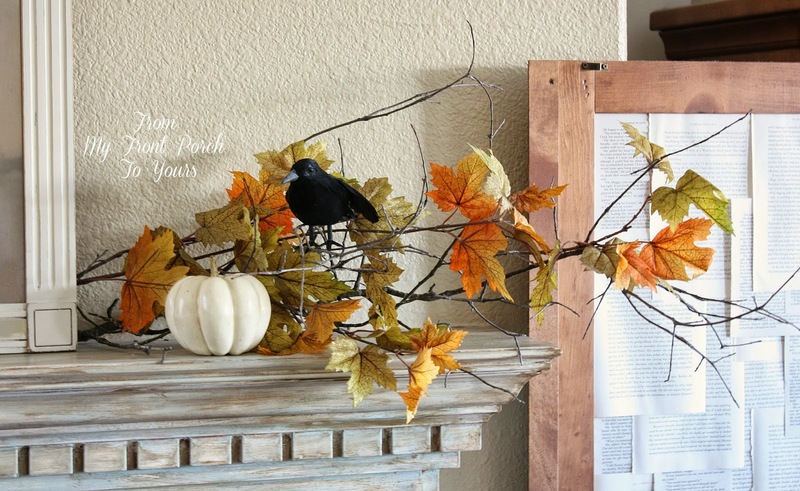 Love your Fall mantel, Pamela! Beautiful colors ... amazing vignette on the table beside it (perfect artwork) ... amazing textures. Happy Fall! Everything looks so nice. Love that little beige colored lamp on the table. So shabby chic! The temps have cooled here in Texas, it's felt wonderful the last couple of mornings for sure. I'm a candle lover also, I just don't think a girl can have too many of them. Never tried the ones that you're writing about so thanks for the great give-a-way. Crossing my fingers to win. I love all your fall decor. So pretty. I cannot wait to see the dining room. I would love to win one of those sweet candles. Now that the temps are cooler I have candles going all the time. Thanks for the chance. You did a beautiful job on your chalkboard! Imperfection adds charm. 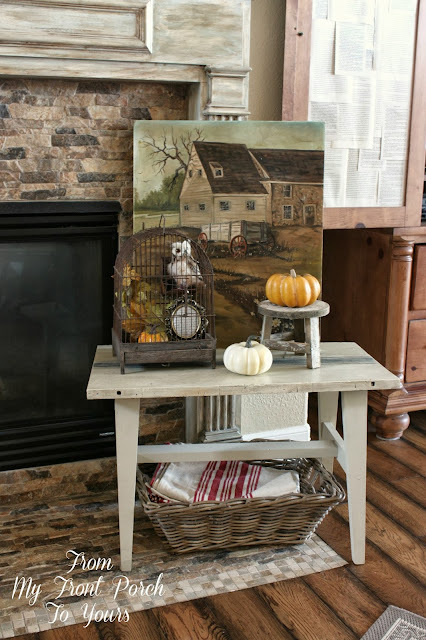 Love the farmhouse painting! I'm inspired to start my Fall decorating today...even in Florida. Your Fall decor is perfect for your new Living room Pamela! Thanks for the giveaway too! Have a great day! Oh, Pamlela - your home looks wonderful- cheerful, simply bright and very seasonally festive. As far as Anita from FAR and your giveaway- oh please, def count me IN - I would love love love to win! Those labels are to-die-for adorable, too. How does one even choose???????????? Ok, Think I got all my entries in. I was already a follower of yours via FB, now I'm also following via GFC. I did my first chalk board for Fall. Had some problems, thanks for letting me know I'm not the only one. Appreciate the tour of your lovely home. 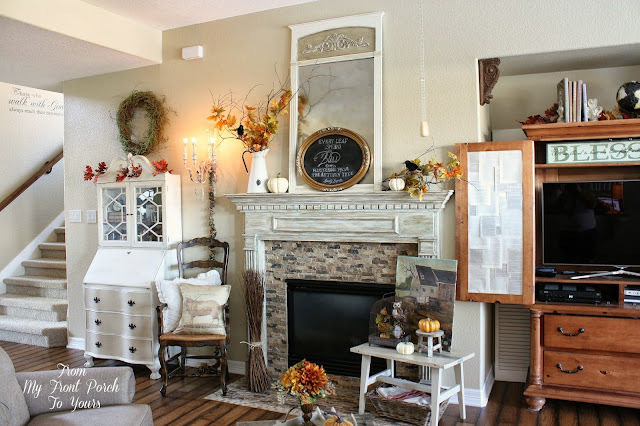 Great mantle redo. Would love to win a candle. Love your living room ! Looks beautiful with all your fall touches ! I follow you on Google friend as April Baker. I love the sweet pumpkin pear spice candle. Thank you for offering such a lovely and generous giveaway. I would choose Patisserie. I love your fall themed living room! The colors are warm and inviting! I especially love the table by the fireplace...beautifully done! 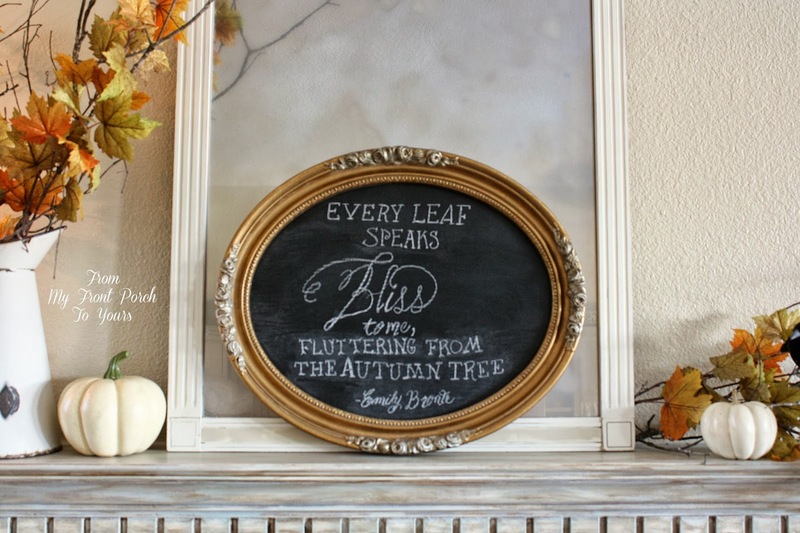 How beautiful your fall decorations are! Your fall touches are just lovely! I love the new addition of the shutters behind the armoire!!! Well done, friend! Sweet Pumpkin Spice sounds to die for!!! I love the way you decorated your mantel. It's gorgeous, you did a good job on the blackboard too! 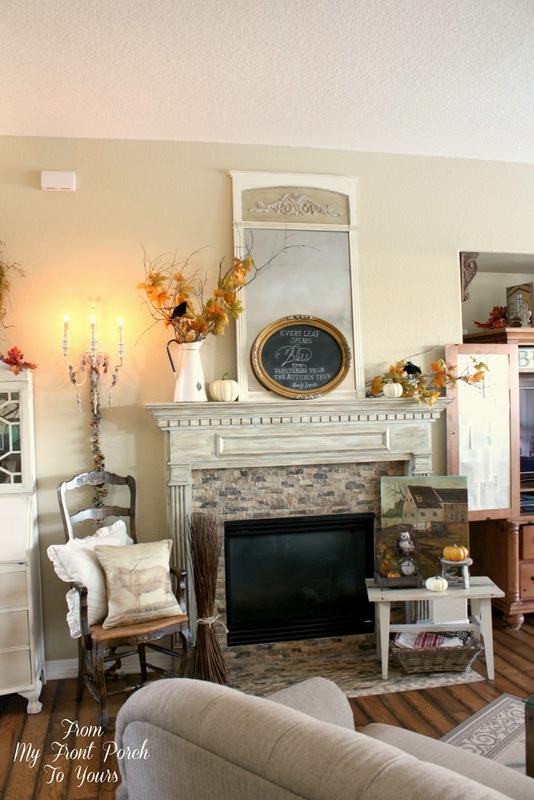 Your home looks lovely dressed for fall! 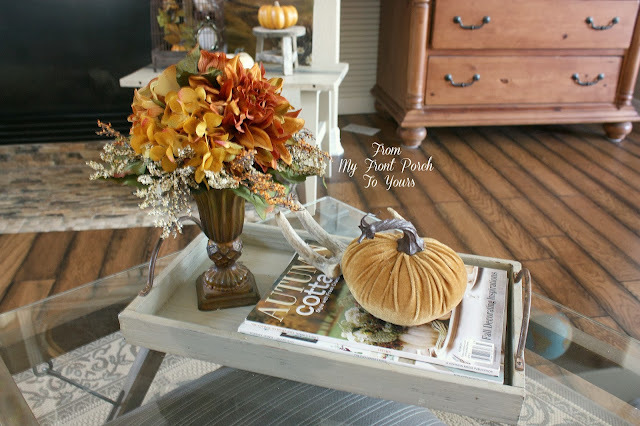 Love all of the decor and beautiful fall touches! I would love to win any of April's candles. We have one and it is wonderful! Thanks so much! Wow I love what you all did I looks beautiful. Well it looked beautiful before too ;) I love the simplicity. Very nice!! I would love the candles, they look so cute and the scents are gorgeous. Love your blog and FB page, you always give me great ideas. Keep up the good work. Love the Fall displays! Love to win a candle! I'd love to try coconut and lime in a candle. Fall=candles! i want any of the ones that smell like pumpkin! I find I can never go wrong with anything vanilla based, but seasonal scents, I love to add in some pumpkin spice or apple. How fun does Carnival sound? Your mantel looks great, Pamela! I'm going simpler this year, too. Love how your chalkboard art turned out. Mine would be horrible if I ever attempted it! 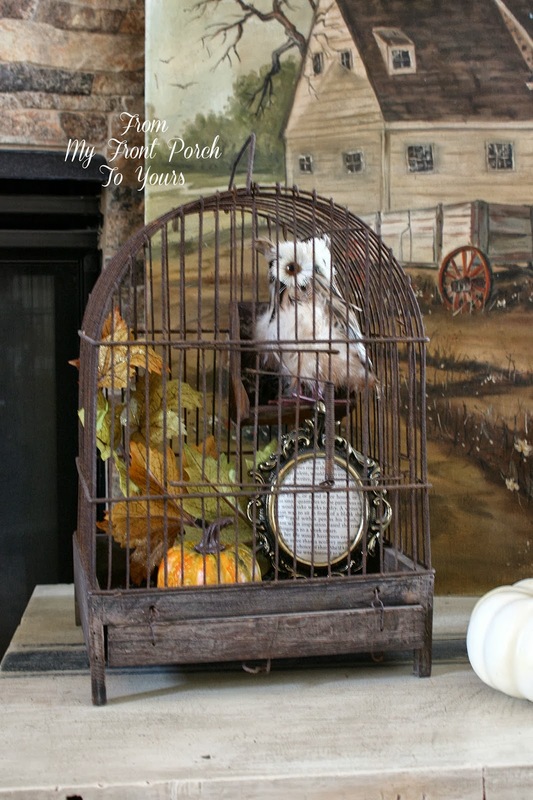 Love the birdcage vignette with your cute little owl. Would love to win the candle giveaway as well!! Thanks for sharing! BARISTA candle.. perfect for the kitchen! Thanks for the giveaway! ohh I'd love to get the Sweet Pumpkin Spice! I love April's candles! Homestead is my favorite- I had one of her tarts burning the other day with my windows open and you could smell it outside. Your home is absolutely gorgeous. I checked out Folky Art Etsy Shop and I think I love the Spiced Apple and Rustic Log Cabin the most. I sent those leaves to talk to you. All of the decor is pretty, but I especially love the fireplace surround, and the birdcage vignette! Would you mind sharing your paint color? I've been searching for the perfect paint color for 2+ years. I really love the new light and bright mantel! that gorgeous enamel pitcher filled with wonderful branches, the light mirror, everything is gorgeous. Love the candles too, I'd love to be entered! the caramel pecan sounds wonderful!! This was tough, they all sound so incredible!! I would love to try the ginger peach Bellini and cinnamon and balsam though would be happy with any of them!! So cute and cozy. Kind of a warm cottagey feel. the candles sound awesome too. maybe pear spice or spiced apple. The caramel pecan sounds really good, but being a pumpkin lover...it's hard to decide. Pamela your mantel looks great...luv the branches! Hope to get mine done this week. Thanks for the chance to win! Would love the Sweet Pumpkin Spice candle. Oh my goodness, I LOVE the look and I simply want the birdcage and everything in it!! Pamela I love what you have done with the house for all. The birdcage is my favorite. Really like what you did inside. I am a huge candle lover, would love to win for sure!!! I would choose Caramel Pecan!! Your living room is beautiful and I love all the fall touches you have added. Thanks for the chance at this great giveaway. Its hard to chose but the sweet pumpkin would be great. Everything looks fabulous Pamela! LOVE that painting on the bench near your fireplace! I would love to win a sweet pumpkin spice & pear spice candle. Thank you! 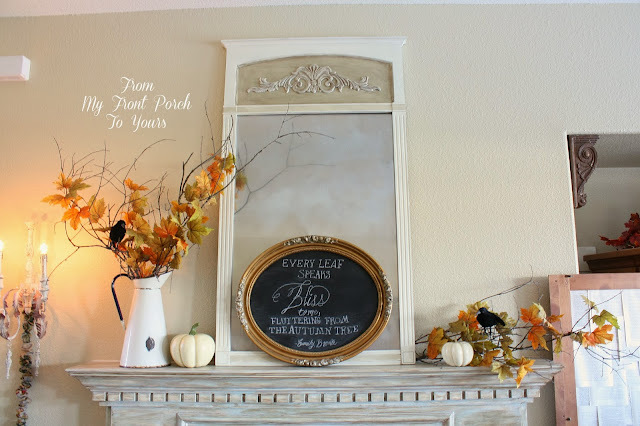 Love your mantle and all of your pretty fall touches. I like the sound of the Madelienes scent. I think it all looks so fun and inviting. You did a great job on the chalkboard art, but writing with those chalk pens is kind of tricky! I adore the little owl in the old birdcage -- so, so cute! This is gorgeous, Pamela! I'm going to share it on my FB page tomorrow! Great fall decorating. Love your ottoman! I would like the Cinnamon & Balsam. I think that is a great combination. Would LOVE to win one of the candles! 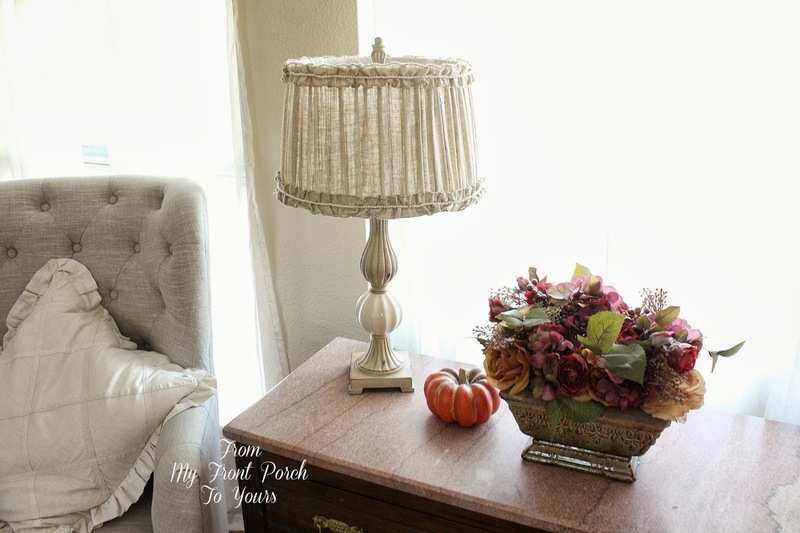 Can't wait to see what other decorating treasures your blog holds! 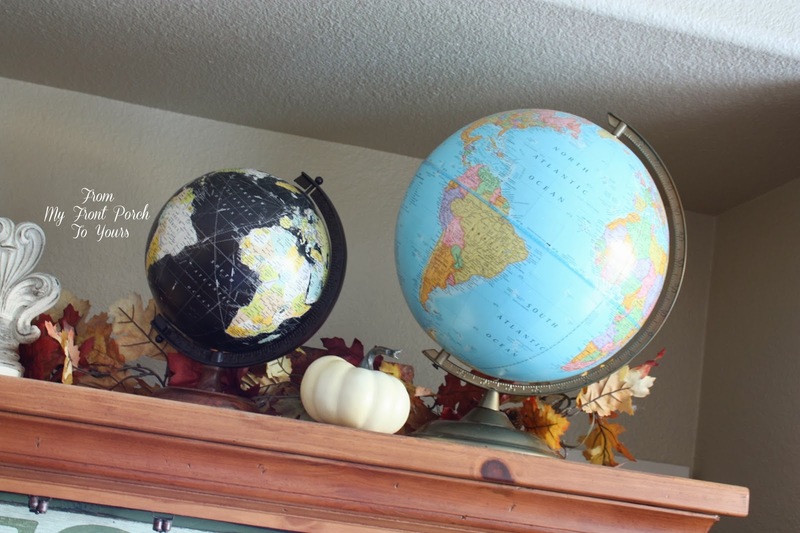 Love your fall decorations! The chalk board picture was the first thing I noticed. I love that! I would love to try all the candles, but the spiced apple and pumpkin spice really sound good for fall. 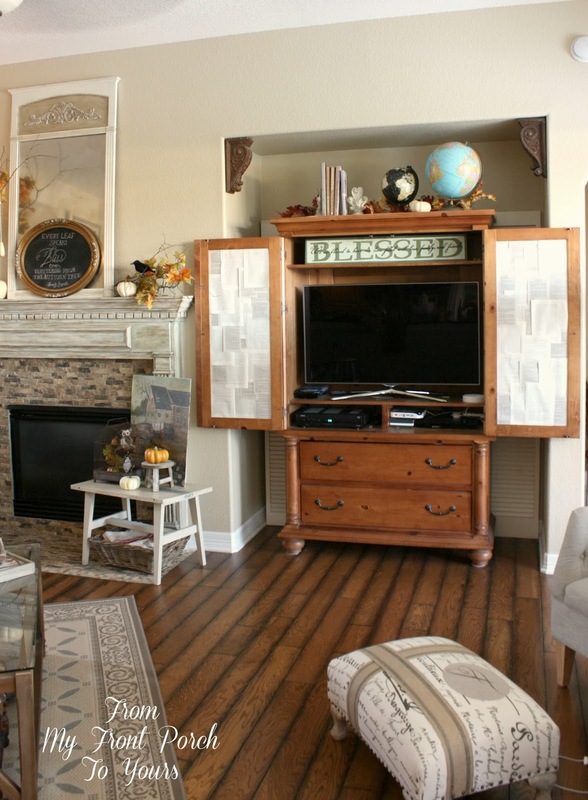 Love the changes you've made to your living room! The soft neutral colors look so good. You've added just enough Fall décor to make it interesting too. I think your chalkboard lettering looks great! I bet that was hard to do. Would love to win candles! I love the vintage labels. Thanks!!! I love April's candles. Thanks so much for the opportunity to win them. If I were to win, I do believe I would love to try the Caramel Pecan. Love your beautiful mantle!Love scented candles! Beautiful, beautiful Pamela..and I love Emily Bronte!